I’m sortof in the eye of the storm here – just back from NY a couple days ago, and off again (to Vegas this time) on Saturday. I’m too busy repaying my sleep debt in preparation for another gongshow week to bother with a costume or anything, and I’ll be in a meeting with my mortgage broker tonight around the time all the kiddies will be roaming around trick-or-treating. Such an exciting life, I know. 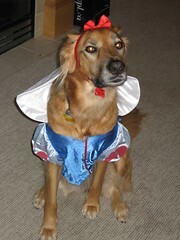 But I couldn’t let the day pass entirely unnoticed, so I figured I’d reminisce with a photo of Sasha in her Snow White costume from last year. Pets in costumes. That’s all the treat I need. sasha is one of the prettiest snow whites i’ve ever seen. i don’t suppose she dressed up again this year?